When the time comes for bathroom renovations, many homeowners are happy to make the biggest changes in one of the smallest spaces. This private room serves as a sanctuary for many people going through their daily routines. Oftentimes, small improvements can result in dramatic changes, improving the aesthetics and comfort of the bathroom for any home. Our home remodeling contractors excel in infusing Old World craftsmanship into each of our services, and bathroom renovations are one quality approach to improving your home. Detail Design & Remodeling is here to provide complete remodeling solutions for homeowners across Georgia, relying on our experience to provide cost-effective results that are sure to impress. 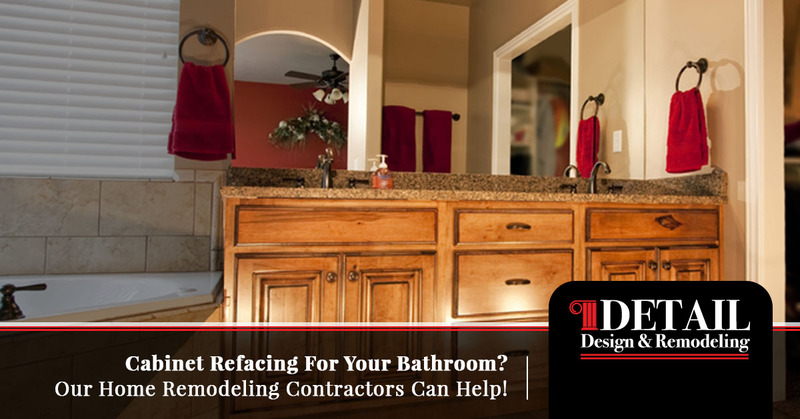 If the bathroom cabinets in your home are in good condition but looking a little drab, now may be the time for refacing services. Our team provides quality bathroom and kitchen cabinet refacing across Dunwoody, Atlanta, and beyond. We’re here and ready to take a look at your bathrooms, providing a detailed assessment and accurate quote for all of our available services. We are passionate about providing long-lasting results for all of our clients, and will be happy to assess whether your home is ideal for cabinet refacing services. If you’re interested in cost-effective updates for your bathroom, be sure to learn more here before contacting us for assistance! Bathroom renovations are often very advantageous for homeowners because they are designed to fit in a smaller space. Fewer material requirements allows renovators to do more with their budget, selectively investing in high-quality elements to make a dramatic impact. If you are planning on incorporating numerous elements, cabinet refacing can help to enhance the mood and theme you are trying to achieve. Try ty to incorporate your fixtures, flooring, and wall colors for a balanced, relaxing style in order to welcome guests. Finding cost-effective upgrades can result in high-quality renovations that did not break the bank. If you’re interested in learning more about our approach to bathroom design, be sure to contact us today! Instead of paying to completely tear out those outdated cabinets, you can elect to give them a facelift with one of our real-wood veneers. The Detail Design team is happy to provide our full lineup of materials and color options. 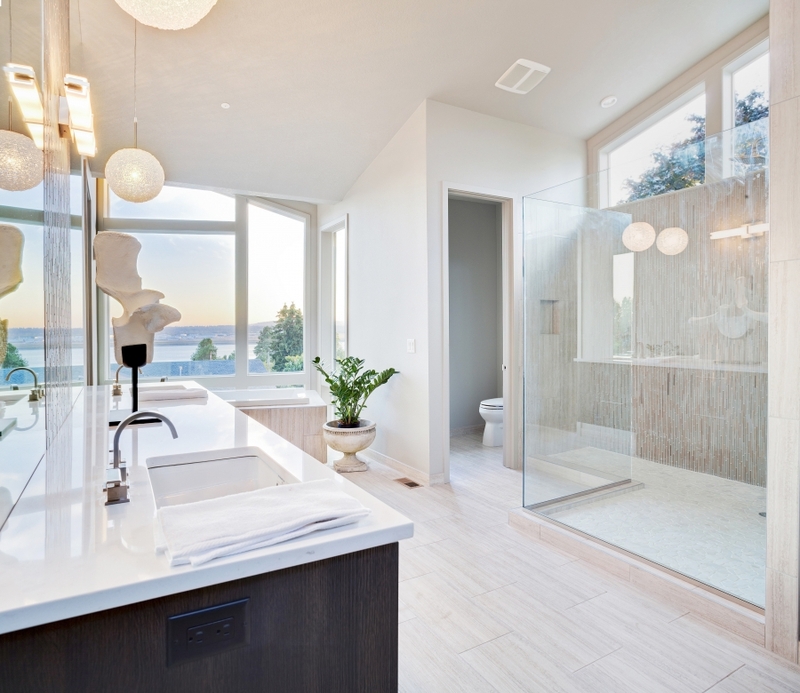 Homeowners will be tasked with going through the varying grains, textures, and finishes to find a combination that enhances — not detracts from — their bathroom upgrades. Looking for painting services or simply want cabinet refinishing? Our home remodeling team can work with to tailor a personalized plan for your place! Keep in mind that cabinet refacing does not benefit systems that are old, rotting, or broken down. In these cases, our home remodeling contractors will provide suggestions for supplemental repairs, restoring your bathroom’s beauty in a stylish manner. Replacing the cabinets in your kitchen or bathroom can result in considerable downtime, as time is needed to completely take the existing system, ship in the new materials, and install it properly. Homes with only one bathroom may create an unwanted situation for many residents, as space is limited for those needing to use the restroom, bathe, put on makeup, or any of their other beautifying routines. Cabinet refacing is very beneficial throughout this process, as this service simply replaces the fronts of your existing system. The result is beautiful, long-lasting cabinet upgrades that are completed in a fraction of the time. Delivering high-quality materials in smaller amounts means your bathroom remodel will likely be much cheaper than any kitchen renovations, but the price tag can still skyrocket if you aren’t careful! Most kitchen renovations nationwide tend to hover around $8,000, with that number varying widely due to a range of factors. Larger bathrooms across the state rely on quality cabinetry to provide storage and beauty for every member of the family, and replacing these elements in their entirety can inflate your project cost. Cabinet refacing has proven to be an effective solution for many homes, as this service reduces the amount of labor and materials required to complete a beautiful upgrade. By simply giving your bathroom cabinets a facelift, you are able to benefit from years of lasting quality that will prove to be much more cost-effective than custom cabinet solutions. Detail Design & Remodeling is here to serve as your home remodeling pros, and our dedication to quality shows in every service we provide. If you are looking for kitchen or bathroom cabinet refacing in Dunwoody, Atlanta, or beyond, our team will be happy to schedule an in-home consultation to discuss all of your options. Our team has the experience, training, and products to ensure a high-quality outcome on the first try. We’ll arrive with our full showroom, creating an accurate quote on the spot for our comprehensive home renovation services. Contact us today to learn more!